Fabrice Estebanez's drop-goal for Lyon consigned Edinburgh to their first loss in European Challenge Cup Pool Four. Tries by Tim Visser and Dougie Fife helped the Scottish side into a 13-10 half-time lead, Romain Loursac crossing for the hosts. Damien Fitzpatrick went over for Lyon in the second period but kicks by Sam Hidalgo-Clyne kept Edinburgh ahead. However, Estebanez turned the match in the French side's favour with only a few minutes remaining. A losing bonus point keeps Edinburgh top of the pool - above next week's visitors to Murrayfield, Bordeaux-Begles. Lyon are two points off their fellow French side. The five pool winners and three best runners-up will progress to the quarter-finals. Hidalgo-Clyne's early penalty put Alan Solomons' side ahead at the Matmut Stadium and Visser soon went over but the conversion was missed. Lachie Munro's penalty for Lyon was followed by Fife's try and Hidalgo-Clyne was again unsuccessful with the conversion attempt. 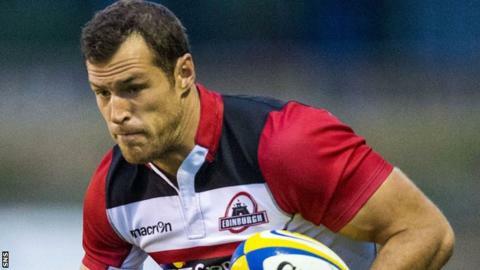 Edinburgh temporarily lost Matt Scott to a yellow card and, during the centre's absence, Loursac crossed for the home side and Munro converted. Scrum-half Hidalgo-Clyne found his range again with a penalty 10 minutes into the second period but Fitzpatrick responded with Lyon's second try. Munro missed the conversion on this occasion. After a series of substitutions for both sides, Munro's replacement Jerome Porical and Hidalgo-Clyne exchanged penalties. And with time running out, centre Estebanez kicked Lyon to victory. Lyon Olympique: Loursac, Bonnefond, Sukanaveita, Estebanez, Regard, Munro, Januarie; Balan, Fitzpatrick, Pungea, De Marco, Njewel, Cerqueira, Ghezal, Matadigo. Replacements: Porical for Munro (66), Loree for Januarie (70), Mavinga for Balan (61), Colliat for Fitzpatrick (53), Roux for Pungea (43), Viljoen for De Marco (71), N'zi for C. Njewel (53), Tison for Matadigo (63). Edinburgh: Cuthbert, Fife, Scott, Burleigh, Visser, Tonks, Hidalgo-Clyne; Dickinson, Ford, W. Nel, Bresler, B. Toolis, Coman, Grant, Denton. Replacements: Te Rure for Cuthbert (66), Strauss for Burleigh (76), Andress for Dickinson (70), Cochrane for Ford (65), Sutherland for Nel (70), McKenzie for Bresler (62), Watson for Denton (62). Not Used: Kennedy. Sin Bin: Scott (33).